A 100% acrylic coating for running track surfaces. Beautifies tracks and provides superior protection against oxidation, raveling, and moisture penetration. The average film thickness of a 2-coat TrackMaster Plus surface falls in a range of 50 to 55 mils, depending on the porosity of the pavement surface. First coat coverage will normally range from 0.15 to 0.25 gallons per square yard depending on the age, roughness, and porosity of the surface. Coverage on successive coats will range from 0.10 to 0.20 gallon per square yard. Yield is based on undiluted TrackMaster. 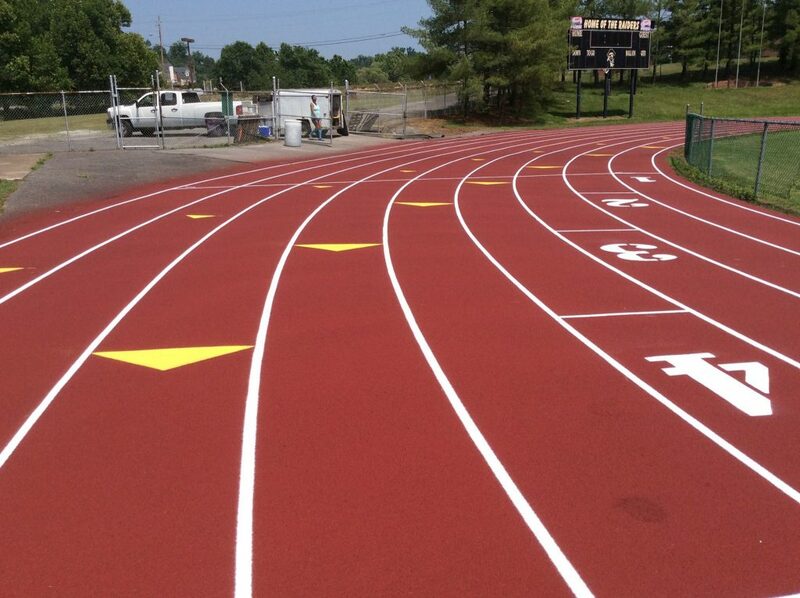 100% acrylic coating for running track surfaces. TrackMaster Plus is a colorized acrylic emulsion manufactured with graded rubber particles designed to impart exceptional flexibility and durability to asphalt running tracks, and other sport surfaces. TrackMaster Plus is designed for beautifying and protecting asphalt bound running tracks and field event surfaces. TrackMaster Plus protects against oxidation and moisture penetration of asphalt surfaces. TrackMaster Plus also reduces maintenance costs and prolongs the life expectancy of line striping. Pavement surface must be cleaned entirely of dust, dirt, debris and all loose materials and vegetation. New asphalt must cure 14 to 30 days before application. Old, oxidized asphalt surfaces may require a coat of Acrylic Adhesion Promoter (see Technical Bulletin CMT-21). Depressions and shallow, damaged areas in the asphalt surface can be corrected by patching with Lane One (see Technical Bulletin CMT-16). Dilute TrackMaster Plus with water using the following ratio: 4 parts TrackMaster Plus to 1 part water. As a coating, TrackMaster Plus is applied using a soft rubber squeegee. A minimum of two coats are recommended, but additional coats may be applied to achieve a thicker system. Allow the coated surface to cure for 24 hours before opening up for use. Stir before using. Temperatures must be above 50°F. both during application and for a period of at least 24 hours after application. Do not apply if rain is imminent or forecast. Keep from freezing. Close container when not in use. Forty-five to ninety (45 to 90) minutes under optimum conditions..
View in Catalog 30 gal. Keg 290 lbs. View in Catalog 55 gal. Drum 550 lbs.